Mykonos is known for its celebrities, not to mention its celebrity parties and this year, one party stood out amongst all the others. Celebrity shoe designer Brian Atwood is no stranger to the island of the winds and windmills and every year, he descends upon Mykonos with entourage of models and wanna-be in tow. But this year was different and his annual party was special. It was the Chicago-born designer’s 50th birthday party and by all accounts of the island’s regular party-goers, it was the party of the season. Atwood, who was once a model himself and previously worked for Versace before launching his own line, went all out for the big 5-0. 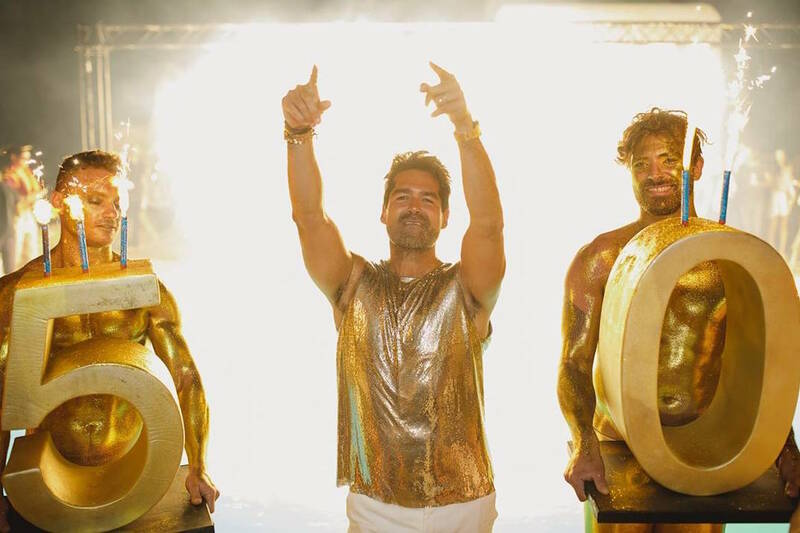 The unofficial agenda (based solely on the Instagram evidence of the weekend) paints a colorful picture of poolside parties, beach time, yacht cruises, and, the main event, a gold-themed nighttime bacchanal. Complete with its own hashtag the Brian Atwood Gold or #BAGold party included posts from dozens of invited guests like Lindsay Lohan, Atwood himself and numerous luminaries from the fashion world. Here are our 15 favorite posts.